THE winner of this year’s Wargrave 10km race says he was encouraged to take part by a work colleague who he beat into second place. Jack Gregory, 26, finished in 33 minutes and 52 seconds, more than a minute and a half ahead of Ben Paviour. A total of 352 people took part in Sunday’s race, which is organised annually by Wargrave Runners. The athletes gathered in the recreation ground off Recreation Road before the 10am start in cloudy but humid conditions. They followed a circular route through Holy Cross and Crazies Hill before completing a final lap of the field on their way to the finish line. 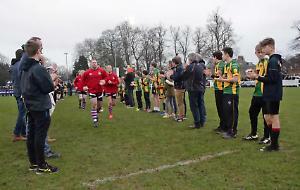 There was also a mile-long children’s fun run around the recreation ground featuring more than 100 youngsters, many wearing fancy dress costumes. Mr Gregory, from Burghfield, and Mr Paviour, from Sonning Common, both work for an sports retailer and sit at adjacent desks. Mr Gregory, who previously took part in the race when he was in his mid-teens, said: “I didn’t remember much of the course but my colleague has been for the last two or three years and he told me about it. Mr Paviour, 45, who runs for Herne Hill Harriers, finished in 35 minutes and 33 seconds. The third-placed runner was Sam Barley, 27, from Ruscombe, who finished in 36 minutes and 31 seconds. The fastest local finisher was 39-year-old Chris Moseley, of Wargrave Runners, who finished in 37 minutes and 45 seconds. His clubmate Richie Bookless came home in 38 minutes and 10 seconds. The first woman to cross the line was Maidenhead AC runner Laura Taylor in 37 minutes and 46 seconds. The fun run was won by Guy Branston. Members of the village scout, guide and brownie groups manned water stops on the route or served refreshments to visitors. Wargrave Runners chairman Steve Huyton said: “We had a lovely day for it. The running conditions were pretty good — about 17C with no breeze, although it was a little bit humid. “You get a mixture of better runners from local clubs and people for whom it’s their only organised run all year. “The winning time was pretty good and on the whole there were some very good performances. A young lad who won the under-18s category came fourth overall. “Lots of people came out to support it. I hadn’t expected the fancy dress but it’s quite a nice idea and makes a difference. The event, which is now in its 36th year, is expected to have raised about £3,000 for charities and good causes including Camp Mohawk, a day centre for children with special needs near Crazies Hill, and Robert Piggott infant and junior schools in Wargrave. The event was sponsored by Physiocare, of Twyford, and the Nuffield Health gym at Piggott School in the village.